When I first saw these Crayola Nail Polishes from Sally Hansen I had to get at least a couple of colors. I’m already a huge fan of Sally Hansen Nail Polish but I loved the bright Crayola colors. 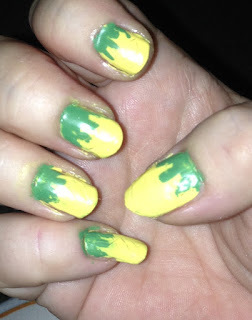 See my review on Sally Hansen Crayola Nail Polish HERE! 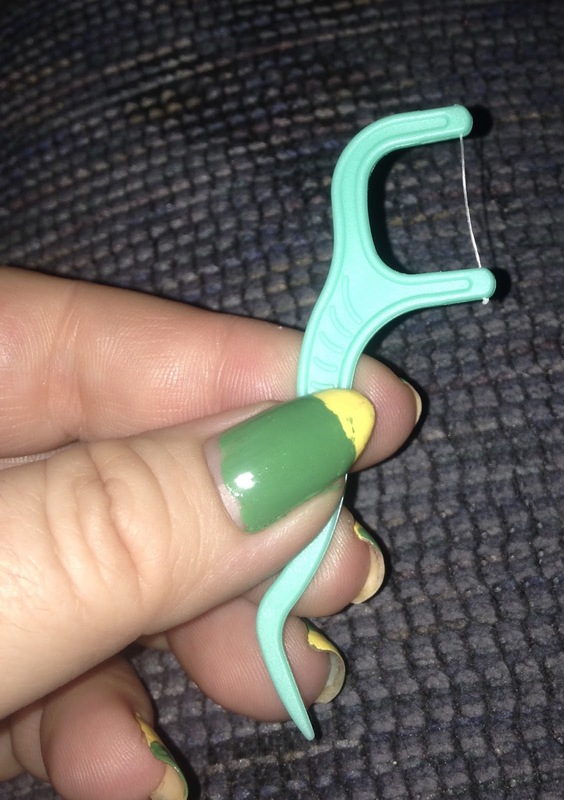 I chose Granny Smith apple – light green and Dandelion – bright yellow. When I was thinking of what type of nail design I could do using only these two colors a pineapple immediately came to my mind. 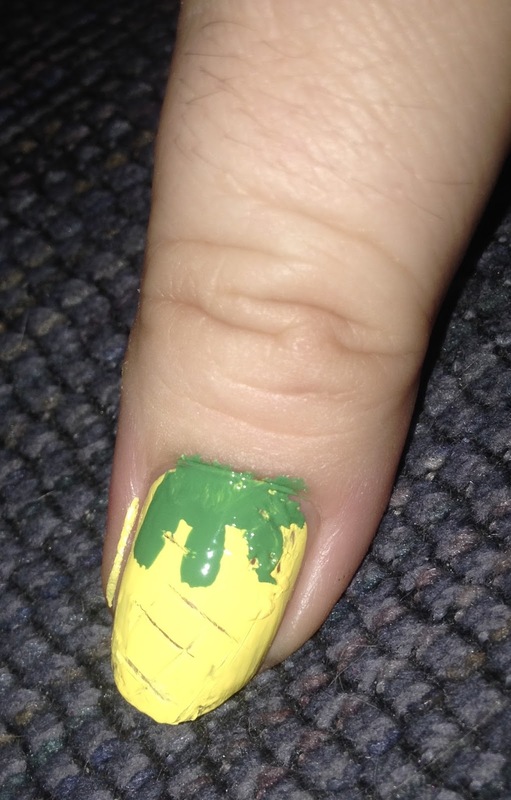 I used a dental floss stick to give a little definition to the pineapple. 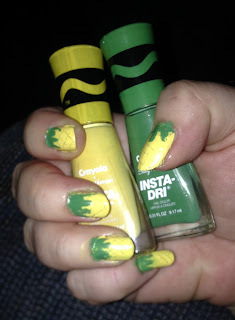 I used the thin side of the brush for the leaves on top of the pineapple but you can also use a toothpick. It’s a pretty design that is fairly easy to do. Each Crayola color nail polish comes with Sally Hansen’s Insta-Dri 3-in-1 technology, meaning you don’t need base coat or top coat and it dries in one minute. - If you aren’t using Sally Hansen’s Insta-Dri 3-in-1 nail polish, apply base coat to protect the nails and prolong the manicure. 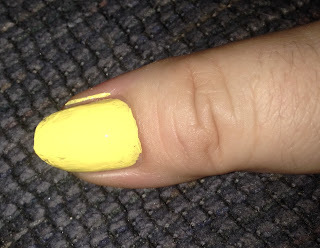 - Apply a Yellow (Dandelion) base color. - You want the polish to dry just a bit - you want it to be tacky but not too wet or dry. Using the dental floss gently create a criss-cross pattern onto the nail. Apply 3 or 4 lines one direction and then apply more lines in the other direction. - Using the thin side of the brush or a toothpick, apply a very small amount of green (Granny Smith Apple) to the top of the nail by the cuticle. 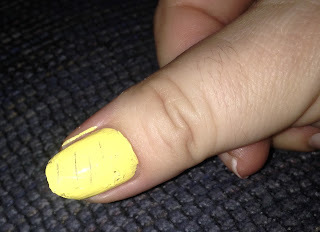 Without adding any new polish, gently drag small sections of polish down the nail. 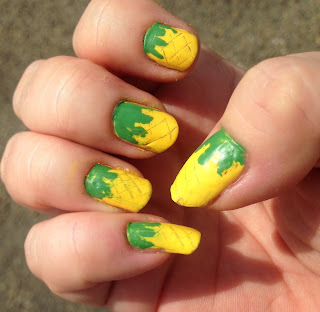 - If needed apply a Top Coat and this is optional apply a Matte Top Coat for a velvety finish. so keep your eye out for them in a store near you!